The gist: Humor is a great psychological tool to get and keeping people on your side. Use it wisely, and use it often—especially when you screw up. Everyone makes mistakes. But what makes one mistake forgivable and another not? You’ve probably seen plenty of instances where big mistakes were ignored. Or the opposite—seemingly insignificant mistakes are blown out of proportion. “How does that happen? Where’s the justice?” you might ask yourself. You may not realize, though, that when you make a mistake, the way it’s received by everyone around you almost completely depends on how you react to it. During the 2014 mid-term elections, Tom Brokaw, a world-famous news reporter, made what would have been a career-limiting mistake on-air. The next day, every media outlet in America was talking about it. But instead of criticizing or making fun of him, they were laughing it off with the air of forgiveness. How did Brokaw turn his massive flub—what would could have been a career-ending move for any rookie reporter—into an endearing news story? And how can you use the same psychological principle to magically recover the next time you find yourself in the same situation? Americans love their TV, but there’s one day they love it more than any other: election day! Once every two years, even the most die-hard TV haters—myself included—tune in for one big night of news on who’ll be elected to what offices and which big ballot measures will be passed or defeated. It’s a serious day, and all the news networks bring out their most popular reporters to cover the night’s events. This year, MSNBC brought out the biggest name they have: Tom Brokaw. Brokaw is discussing the latest poll results with a panel of anchors when a loud, obnoxious alarm starts to sound. For the first few seconds, they all ignore it. Then, they start looking confusedly at each other. Finally, Brokaw asks, “Could that be me?” before sheepishly realizing the phone in his pocket is the culprit. A less experienced news anchor might quickly turn the phone off and pretend like nothing happened (even though everyone knows). They might be deeply embarrassed and apologize profusely before rambling through the rest of the show, thrown off by the flub. Everyone will forgive them temporarily in order to get on with the show, but you can be sure they’ll get a dressing down once the cameras are off. 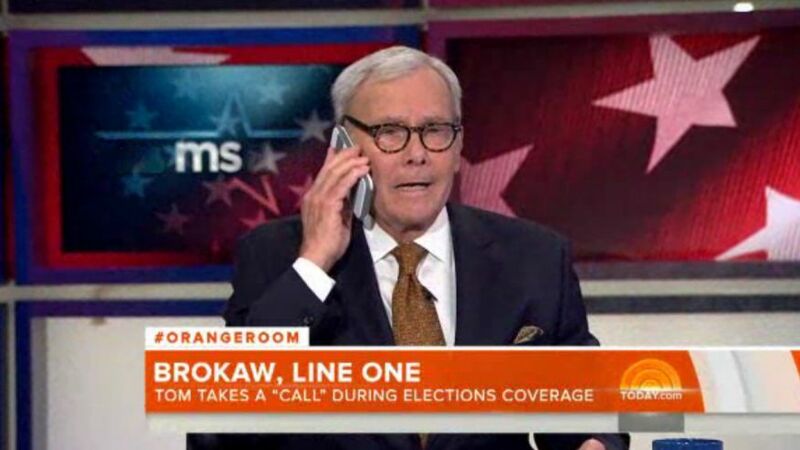 First, Brokaw is clearly shocked when he realizes the sound is coming from his phone. Next, he pulls the phone out to silence it and acknowledges he made a mistake. Rather than end on a sour note, though, he takes the next step and turns it into a joke by pretending it’s his wife calling to remind him to pick up the milk and feed the dog. When the incident begins, you can see the other hosts laughing nervously. By the end, though, they—and the whole set crew—are honestly cracking up. Finally, he gives a quick apology and gets right back to business. Fast talking comedians excel at this. They mess up their lines all the time, but the crowd still loves them because they can laugh their way through it. For an example, watch any episode of The Colbert Report or Robin Williams doing stand up. For any host without a sense of humor, the headlines the next day would have read something like, “News host makes a fool of himself in front of the nation.” But Brokaw received none of that. Instead of laughing at or pitying him, everyone who picked up the story focused on how funny the way he handled it was. His humor became more important than the mistake. The next time you find yourself staring out at a crowd of people who just saw you make a huge mistake—and they know it was a mistake—don’t ignore it. Don’t try to cover it up. Don’t nervously apologize over and over, dwelling on it and making yourself look like a schmuck. Acknowledge the mistake. There’s no hiding it now. Everyone saw! Correct the mistake. If it’s necessary, make whatever correction you need to get things back on track. Make a joke. Make fun of yourself. Get everyone laughing and they won’t care anymore. Move on! And don’t bring up your flub again until you’re totally in the clear. I’m a highly distracted walker. When I’m walking around, I love looking at everything except what’s right in front of me. The world is just so interesting. As a result, I’m prone to falling down and running into things. When this happens, I like to face everyone who saw and give a deep bow as if to thank them for watching my performance. This way, they spend less time worrying if I’m hurt or thinking I’m a dummy and more time laughing at the funny guy. Humor is one of the best psychological tools you have for getting and keeping people on your side. Use it wisely, and use it often—especially when you screw up.